This powerful little shop covers the spectrum of in-demand marketing services going deep across creative, digital, media, and analytics. A focus on long-term success of clients versus short-term goals is part of what has helped Riley Hayes stay an important partner for over 20 years. They often win new business because of their passion, expertise, process, and dedication. The team is a good mixture of tenured marketers with valuable acumen and up-and-coming thought leaders who bring a fresh, cutting edge perspective to each project. Founder, Tom Hayes and co-owner, Kerry Krepps play a big role in each client’s relationship avoiding any extra layers. They’ve done a great job of staying relevant by bringing on top media, technology, and creative directors who not only push the boundaries but also ensure the integrity for which Riley Hayes is known remains consistent. The initiative was a full experiential project requiring strategic partnerships with local and national media and community groups. It included lighting, music, plant life and visuals on trains, streets, and in Millennial Park. Another recent and very successful campaign spearheaded by Riley Hayes showcases their strategic and creative excellence via broadscale Direct Mail for Walgreens’ award-winning loyalty program, Balance Rewards. These highly-targeted mailers were designed to drive revenue and increase customer loyalty. Since its launch in September ’12, the program has gained over 80 million members and has greatly contributed to Walgreens continued success. See more of their work including pro bono efforts with Nature Valley for various charity events to get inner-city kids enjoying the outdoors. If you’re seeking an advertising agency that will take a multi-dimensional look at your brand, then look no further. Riley Hayes has combined something old, new, borrowed, and Blu (ha!) to build a process that calls on the principles of Aristotle, Noble Purpose, Brand Pyramid, and a self-crafted Relevance Audit. In fact, be on the lookout for an upcoming book launch co-authored by Tom Hayes introducing their studied elements of relevance: Authenticity, Mastery, Empathy, and Action. 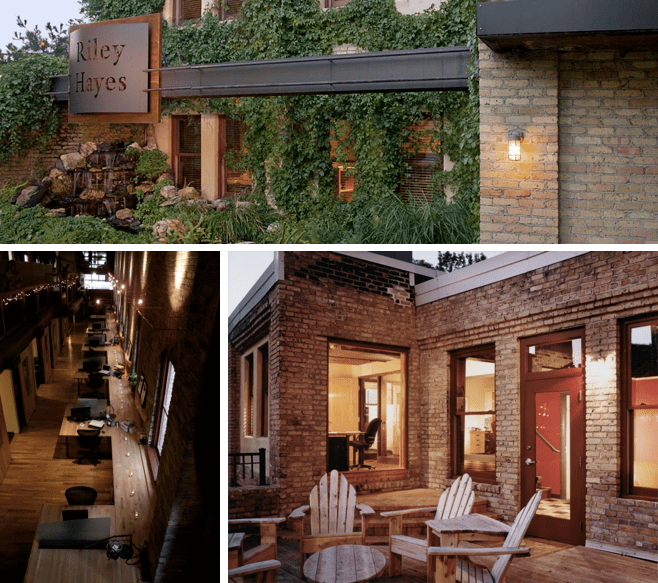 Our late Friday afternoon stop at Riley Hayes was near euphoric. The interior of this reclaimed train-engine repair house on the banks of the Mississippi is lofty but cozy, two seemingly impossible attributes to execute simultaneously. The outdoor patio offered the perfect respite from the heat wave bike ride we were on and proved to be a perfect place for client meetings and creative daydreaming.